WP is delighted to announce the winners from the fourth annual Wealth Professional Awards at the Oscars-style event last night. 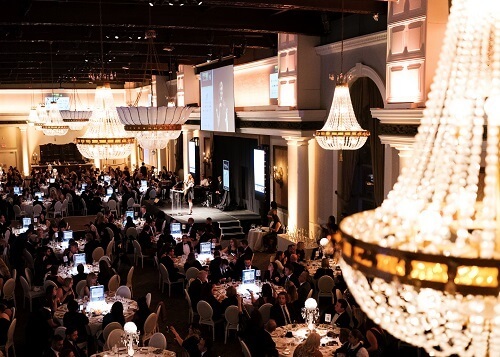 Professionals from across the country attended the show at The Liberty Grand ballroom in Toronto as the top performers took home the industry’s most coveted prizes. Tuxes, cocktail dresses and victory speeches were the order of the night as hundreds of the industry’s leading figures eagerly anticipated the announcement of this year’s honourees. These included Kevin Hegedus, of PWM Private Wealth, who collected The Mandeville Private Client Award for Advisor of the Year. The awards spanned the breadth of the financial industry, with winners in 22 categories drawn from all over Canada. It was produced by KMI Publishing and Events – the organization behind Wealth Professional magazine and wealthprofessional.ca. It was a night of rapturous celebration, especially for Rebecca Horwood, director, wealth management and portfolio manager for The Horwood Team, Richardson GMP, who took home The Invesco Canada Award for Lifetime Achievement in the Wealth Management Industry. AGF Investments Inc., "Invested in Discipline"